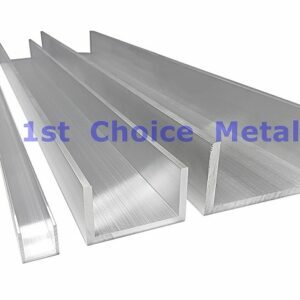 1st Choice Metals are an independent, UK based supplier of Aluminium Channels. Often reffered to as Aluminium C Channel and Aluminium U Channel, Aluminium Channel is essentially a Box Section, with one side ‘missing’. 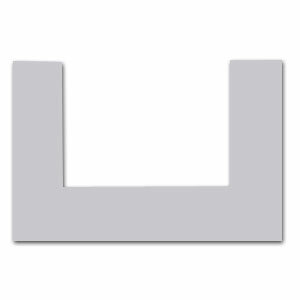 If sat on it’s base it looks like the letter “U” and if lay on it’s side it forms the letter “C”. Commonly an Aluminium Channel is used to fit over another item either to cap it off or to house it. For example, a common use for Aluminium U Channel is to make frames, to either house glass or perspex (i.e window frames), or a wood product such as plywood. The fact that Aluminium Channel is great for welding and also has excellent corrosion resistance, makes it a great product for making window frames. If you are in need of someone to supply you with a finished product, then let us know. Not only can we weld your Aluminium Channels into a frame, we also offer competitive prices on products such as Perspex, Polycarbonate, Acrylic, Macralon etc – therefore we can supply your frames cut, welded and complete with the glass substitute. Another common use for Aluminium Channels is as a slider or runner – whereby an item such a door or a roller can run along the inside of the channel. Although in most cases Aluminium Channel is purchased with the intention of something sitting or running inside of it, frustratingly Aluminium Channels are manufactured based on their outside dimensions, rather than the gap size. Please see the table below detailing each of our Aluminium channels Outside and inside dimensions. Please be aware that the Outside dimensions and the material thickness dimensions are both subject to European standard +/- manufacturing tolerances. This can have a slight baring on the actual gap in the channel. Therefore the sizes quoted below are the nominal sizes. Should the gap width be critical to your application within +/- 0.7mm then please contact us prior to purchase and we can confirm the exact manufacturing tolerance for that particular size of Aluminium Channel – we can then advise you as to what the minimum and maximum width of the gap could actually be.